Monitor the current speed of your network. 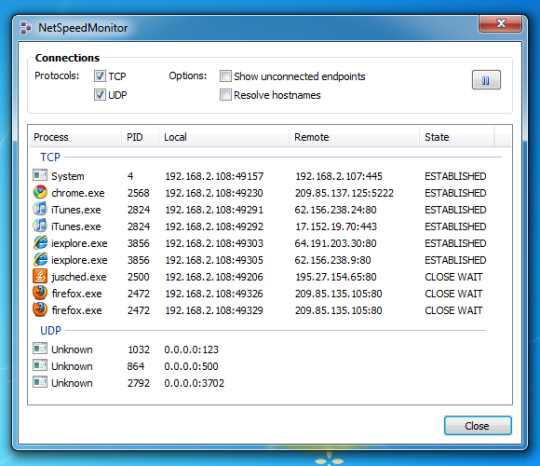 NetSpeedMonitor is a lightweight Network Monitoring Toolbar for your Windows Taskbar designed to be used on computers that run Windows XP, Windows Server 2003, Windows Vista or Windows 7. With NetSpeedMonitor you can monitor the current speed (up- and downstream) of your Network Interfaces and the amount of data transferred. In addition to the Connection Table with all TCP/UDP endpoints and the Toolbar Tooltip with a quick and short traffic overview, you can also see detailed daily and monthly Traffic Statistics. 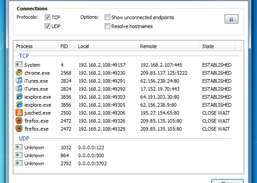 NetSpeedMonitor toolbar requires no additional drivers like other Network Monitoring tools do. Manage, monitor, and report network inventory. Ease your day-to-day desktop management. Disable wireless computers when connected to LAN and enable on disconnect.